Supplement programs should deliver a high quality nutritionally balanced product to the entire herd, while reducing associated costs such as time, labor and equipment. This can be accomplished without compromising your overall nutritional program. 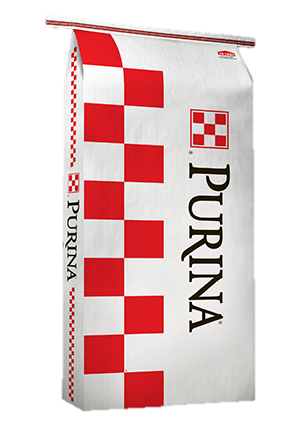 Farmers Win Coop and Purina Animal Nutrition offer a variety of supplements for your herd. 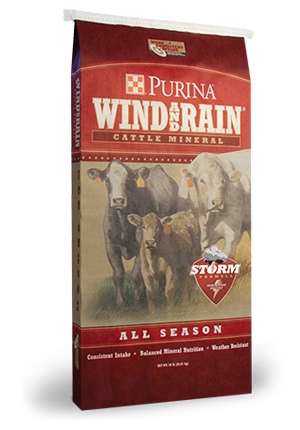 Purina Wind and Rain® STORM® all season cattle minerals are designed to correct the mineral deficiencies of the available forage in a palatable, weather-resistant, granular formula. Wind and Rain STORM's large particle size and special formulation keeps the mineral from absorbing water and blowing out of the feeder. The STORM technology provides the ultimate in weather resistance to reduce waste and makes Wind and Rain STORM Formula more economical to feed than conventional loose minerals. • The ultimate in weather-resistance — more of the mineral winds up in the cow, not blown on the ground or spoiled by getting wet. Wind and Rain SF 4 Mineral (FWC product 10614) - a 14% calcium, 7.5% phosphorous non-medicated supplement. It meets 100% of zinc, copper, manganese and cobalt trace mineral requirements using Zinpro Availa® 4 complex trace minerals. Is a proven management tool that protects your investment by increasing the selling weight of your stockers while preventing and controlling coccidiosis. Wind and Rain Mineral Tub (FWC product 10637) - A mineral that is the ultimate in weather resistance, palatability and consistent consumption, all in its own mineral feeder. Assures that your cattle are getting the proper levels and ratios of all the 14 essential minerals cattle need for health, growth and reproduction. Horn flies have a significant impact on the cattle industry. 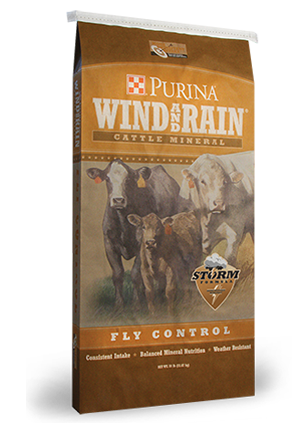 Purina's Wind and Rain® STORM® fly control mineral interrupts the fly life cycle and reduces overall fly population. Altosid (IGR) prevents the breeding of horn flies in the manure of treated cattle. Learn more in this Fly Control video. Purina Wind and Rain STORM Fly Control - a 14% calcium, 7% phosphorous non-medicated supplement with Altosid® for fly control. It meets 100% of zinc, copper, manganese and cobalt trace mineral requirements using Zinpro Availa® 4 complex trace minerals. Calculate 1 bag per cow for 6 month season. 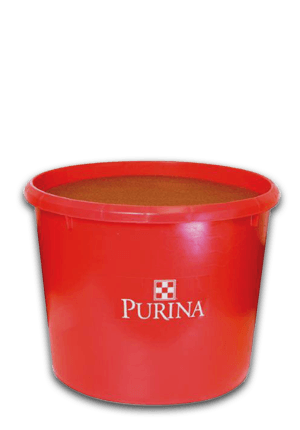 Purina Wind and Rain STORM Mineral Tub - A mineral that is the ultimate in weather resistance, palatability and consistent consumption, all in its own mineral feeder, with Altosid for fly control. It has the flexibility to provide partial to complete supplementation of minerals and vitamins based upon animal requirements. 5 cows will use 2 tubs in 6 months. Creep feeding is feeding for maximum growth of bone and muscle without laying down fat. 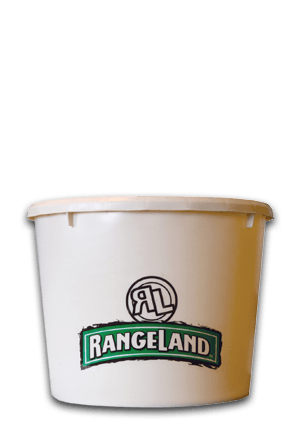 Use RangeLand Creep pasture pellets until July or August and then switch to Accuration Range Supplement to limit the intakes when the calves are older. If the pastures get low at the end of the season and they consume too much of the pellets, they are more inclined to bloat. Purina® RangeLand® Calf Creep 14 - a 14% supplement with Bovatec that is designed for suckling beef calves. It supplements the cow's milk to improve the growth rate of calves with good genetic potential. 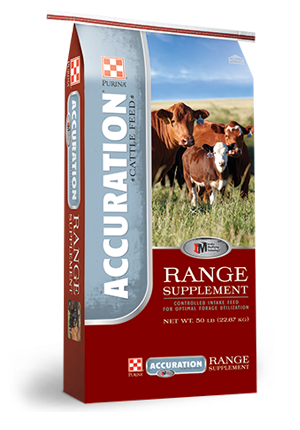 Purina® Accuration® Range Supplement 33 - a 33% protein intake modifier supplement that, when fed according to recommendations, balances the nutritional deficiencies in fair-quality forages (native or improved grass hay) or poor quality forage (dormant grasses or crop residues). Over 30 years of Purina research has gone into the formulation of Accuration so that it will dependably control intake based on forage quality and the cattle's nutritional requirements. Accuration contains IM (Intake Modifying) Technology, which causes cattle to consume multiple small snacks daily of the supplement, which optimizes the flow of nutrients to the digestive system, thereby increasing forage intake, overall utilization and cattle performance. Accuration Range Supplement works well for dairy heifers on pasture as a late season creep feed. It's available with Rumensin in bag or bulk.